Use the options under the Settings tab to customize the way your calendar looks and functions. You may need to click on the plus sign (+) beside each section to view more options. Title - This is the title of your calendar. It will display similar to the way a header on a content box displays. Calendar Width - Here you can control the width of your calendar. 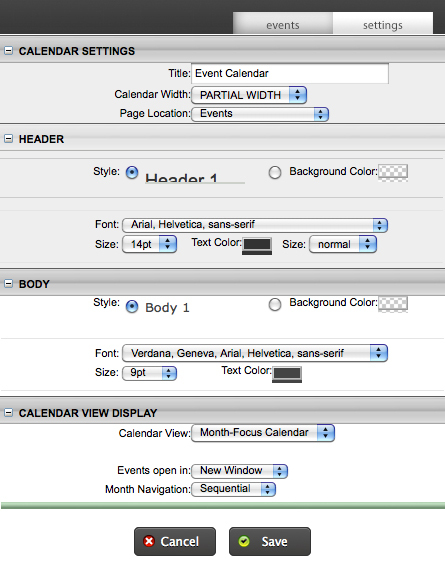 Choose Full Width for your calendar to stretch across the entire page. If you have multiple columns on your page you’ll want to choose Partial Width. The Month and Day Focus views work best as Full Width boxes. The Coming Events view works best as a partial width box. Page Location - New calendars will always be added to the page you are currently on. However, if you are editing an existing calendar you can update this to a page you would like to move it to. Header Background Color - This color will appear behind the title of your calendar. Header Font - This controls the font style of the header only. Header Size - The size of the header text is determined here. Header Text Color - Your calendar title will be displayed in this color above the calendar. Body Background Color - This color will display as the background of the calendar. Body Font - This controls the font style of the body of the calendar. Body Size - The size of the calendar body text is determined here. Body Text Color - All of the text of the calendar, other than the title, will display in this color. Calendar View - Here you can choose how you want your calendar to display. Month Focus calendar - The Month Focus calendar is very similar to calendars that you are familiar with. It is great for giving you an overview of an entire month. This view also gives you the option of how to display the event details once someone clicks on an event title. You can choose either New Window, which will display the details in a pop-up window, or in a side bar if you choose Event Box. Day Focus - This calendar displays events for 1 month in a list format but separated by days. You will find this calendar especially useful if you have many events on the same day. This calendar also has space in the top right hand side of the calendar to display featured events. Coming Events - This list of calendar events is great to place on your homepage. It lets site visitors know about the events that are coming up soon. You can enter how many days worth of events to display.